Comments: The black-footed ferret is considered the most endangered mammal in North America. In the distant past, it was highly regarded by the Plains Indians and used in headdresses during religious ceremonies. About 90 percent of this predator’s diet consists of prairie dogs. Prairie dogs have declined greatly and now inhabit only 1.5 million of the 700 million acres they once occupied. As prairie dog colonies shrank in size and number, black-footed ferrets have suffered local extirpations and the species was even thought to be extinct until being rediscovered in Wyoming. Researchers have found ferrets will travel a maximum distance of 4.3 miles in a night. If prairie dog colonies are not nearby, ferrets become isolated, suffer from inbreeding and become even more vulnerable to diseases. 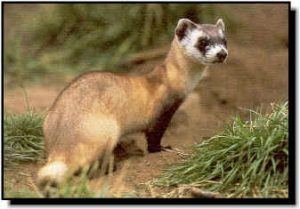 In Kansas: Black-footed ferrets were re-introduced at two sites in Logan County in western Kansas beginning in December 2007, 50 years after the last ferret was seen in Kansas. The locations were on large acreages where good-sized prairie dog colonies were present. The ferrets have thrived in their new situation.